Bigwipes Scrub & Clean wipes are dual-sided, antibacterial wipes added aloe vera and vitamin E to protect and nourish the skin. The improved scrub-side provides exceptionally fast and effective cleaning. 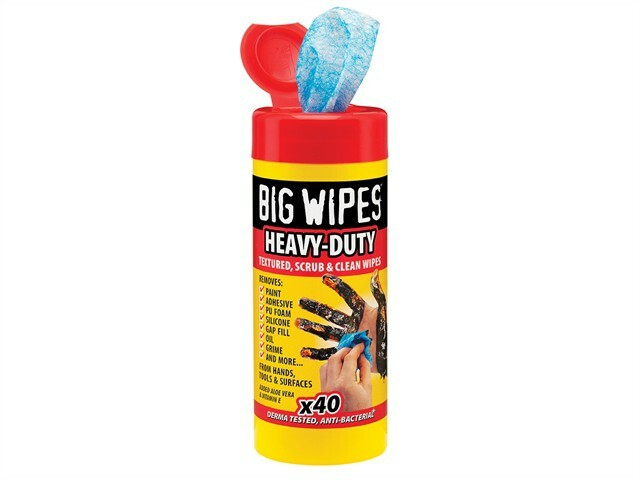 The wipes easily remove paint, adhesive, PU foam, silicone, gap fill, oil, grime etc. from hands, tools and surfaces. Supplied in a tub of 40.